The enormous and extremely expensive Florijn As project is changing Assen. While there are many benefits for drivers due to the Florijn As project, there are few changes which are good for cycling. There is plenty of glossy publicity material available on the website of the project but actual detailed plans have not been easy to access. In this case, I had a chance to view the plan on the right only on two half morning open days late last year. I was surprised to find that the works being presented as part of the Blauwe As segment of the project extended beyond Het Kanaal and also involved changes to nearby Jan Fabriciusstraat. 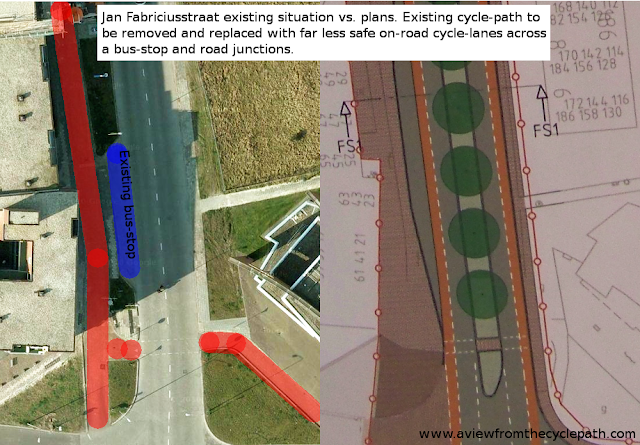 It was also a surprise to find out how hostile to cycling the plans for "improvements" to this street are. entire area ahead was turned into pavement. more dangerous position left of the bus-stop. Jan Fabriciustraat is extremely wide. There is no problem at all with providing well for cyclists in this location, as is demonstrated by the current arrangement in the northern part of the street. Next to the road there is currently a 4.5 m verge, a 3.6 m cycle-path and a 4.5 m pavement. The area is wide enough that a bus-stop built as part of the verge has ample space for bus passengers to stand as well as for the cycle-path and a generously wide pavement. This cycle-path has existed in a half finished state for several years, having been built to serve relatively new buildings on the Northern part of the street. It was clearly the intention of planners at that time that the cycle-path would be extended to the south when the next "block" was re-built. Unfortunately, when the new Citadel development was built, the architects choose to ignore the good design of the existing infrastructure and instead send cyclists onto this busy through road. Rather than bikes crossing a side-road 5 metres from the road at 90 degrees and with maximum visibility of cyclists by drivers and visa-versa, a dangerous junction was created where drivers are required to turn their heads 180 degrees and look through their cars to see cyclists and where cyclists find it hard to judge what drivers will do next. The photos above show a view pointing towards the south of the cycle-path shown on the left here. If there is space for trees with the redevelopment, surely there is also space for cyclists. Moving cyclists from a safe wide (3.6 m) cycle-path onto a narrow (1.3 m wide) on-road lane on a road which policy has recently made even more busy will not improve cycling safety. On-road cycle-lanes do not work well. The problems that they cause are well known and can be observed across the world and all across the Netherlands. But we don't need to go far to see the problems because they can already be seen on the short section of Jan Fabriciusstraat already transformed, as demonstrated in my video above, and in a very similarly designed street a short distance away within Assen. That this is an inadequate design has already been demonstrated quite comprehensively so why is the same mistake being repeated ? What are standards for ? The designer of these lanes in this location hasn't even tried to make the best possible job of them. Current Dutch recommendations call for a 2 to 2.5 metre width for on-road cycle-lanes, and an absolute minimum when space is tight of 1.7 metres. But these lanes on a very wide road with much traffic are just 1.3 metres in width. Good practice calls for bus-stops to be bypassed so that conflict between buses and cyclists is reduced but that has also not been done in this instance. Indeed, it is proposed to remove a bus-stop bypass and push cyclists in the cycle-lane into conflict with buses. 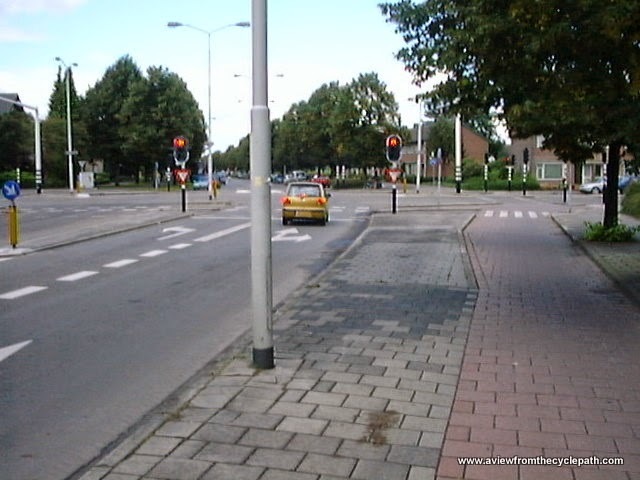 The problems which result from drivers turning across cyclists in on-road lanes at side-road junctions are well known but have been ignored even though there are good examples right here in Assen of how these junctions should be designed. As a result of the hostile conditions for cycling, most people who cycle here already use the pavement and not the on-road lanes. Where the cycle-path should have been continued there is now a ten metre wide pavement. Cyclists have been provided with a narrow 1.3 m wide on-road cycle-lane. The architects may have thought that this empty pavement outside their new building (Citadel) would look nice, but it's of no practical purpose whatsoever. On-road cycle-lanes in the Netherlands are supposed to be an absolute minimum of 1.7 m wide if space is tight. On this road, just 1.3 metres has been allocated for cyclists. Poor design which didn't take account of how real people behave has created a de-facto shared use path with the inevitable accompanying conflict between cyclists and pedestrians. A great example of Wide Pavement Syndrome - the tendency for modern architects to create enormously wide pavements (sidewalks) in places where few people walk. It's also of note that there is very little textured paving to help blind people in this new development. Combined with the huge areas without any kerbs, especially between where pedestrians walk and where trucks park, as well as where various items of street furniture are placed, it would appear that the walking environment for people with blindness are not good. That's a contrast with the older very successful treatment of city centre streets where there is extensive textured pavement. Citadel / Cite. Misleading impressions. videos above for what this really looks like. I wrote about the problems with the Citadel centre shortly after it opened because somehow the developers had not only rebuilt this road with the narrow on-road lanes shown above but also forgotten to include proper cycle parking for this new shopping centre in a city where most shopping is by bicycle. It was an absurd thing to have happened and at the time I assumed that the problems would somehow be resolved. That has not happened. Cyclists still have to use a temporary indoor cycle-park in the car garage. We're now facing the situation where rather than the problems caused by this new development being tackled, they are to be spread further along the same street. not at all how it looks in reality. It's important to learn from history in order not to repeat it. Rather than progress, what is being proposed here is a return to the policy of 50 years ago when cycle-paths were being removed from Dutch cities to make space for more cars. Like most cities, Assen fought these mistakes in the 1970s and 1980s and recovered from this mistake. But in this case we need look no further than the misleading architect's impressions from the existing development. These images never did represent reality. 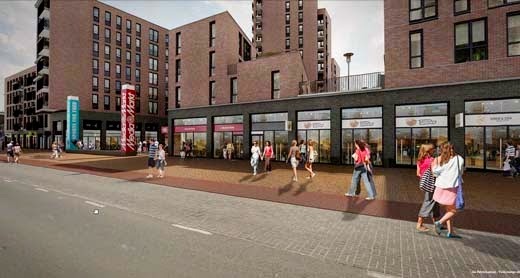 Why are we continuing to develop the city based on images like this which are designed to mislead ? What the street really looks like. It's no accident that deliveries happen here as that's what the architect designed. It's also no accident that people cycle on the pavement here because the cycle-lanes on the road are inadequate and unsafe. The difference between the architects imagination and real life is due to the designer not having taken into account actual usage. On the other side of the road, a dangerous bus-stop has already been built. Children use this route to get to and from school. Have the designers of the Florijnas project forgotten about stop de kindermoord ? Why is Assen following a trend which has proven to be a mistake elsewhere ? cycling Where's that ambition now? 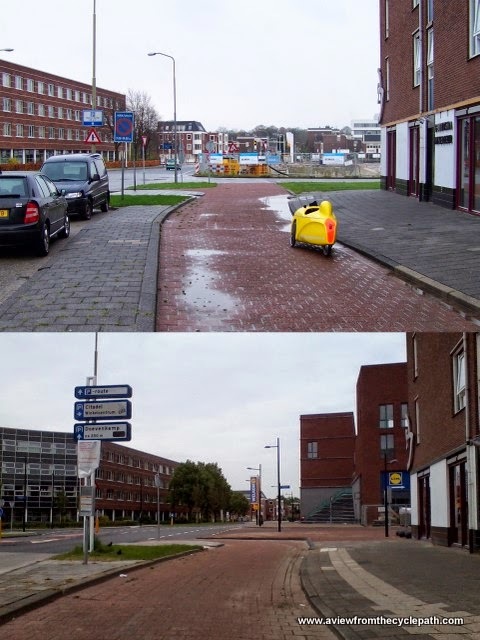 Other examples of where Assen has made recent planning mistakes include the unpopular and dangerous Shared Space at Kerkplein, the construction of inadequate new bicycle bridges across Het Kanaal and the area outside the new cultural centre. In each of these cases, just like Jan Fabriciusstraat, architects produced imaginary impressions of what the areas would look like in the future which were not grounded in reality and which absolutely do not represent the reality of what happened after their designs were built. The Netherlands led the world in cycling between the mid 1970s and just a few years ago because the people involved quietly got on with engineering excellent solutions to the problems which cyclists faced. The result was more, safer, cycling. It was engineering, not architecture or marketing, which grew cycling in the Netherlands. The same problems remain now and the same solutions are required but we're not seeing the same solutions. Unfortunately, the people who did the very good groundwork decades ago have now mostly retired and their contribution is being forgotten by the new generation of planners, who are far more interested in promotion of their ideas than in taking on the problems that they are causing. "Innovations" should not be praised until the results have been evaluated. It's important to note that this problem is not localised to Assen. This is a national problem. The Netherlands is unfortunately repeating the same mistakes as caused a decline in cycling 50 years ago and the likely outcome is that cycling will again start to decline again. We first became interested in moving to the Netherlands around 20 years ago. What impressed me then was that this nation was very quietly getting on with building ever better cycling infrastructure and the results were plain to see everywhere: Cycling was growing, cycling was becoming safer. The Dutch saying "Meten is weten" (Measuring is knowing) was very much in vogue. The country wasn't making much noise about what was happening, they were getting on with engineering a better world for Dutch people and this most certainly involved improvements for cyclists. in the middle of the road are wide. This has changed. It seems now that marketing is being substituted for engineering. Rather than genuinely but quietly making things better, the country has started to boast about achievements with a view to exporting the services of Dutch companies. Unfortunately, what they've been offering is not nearly so high in quality as what was being built here, and now we're seeing the same low quality design taking over in the Netherlands as well. We have hosted hundreds of visitors from outside the Netherlands on cycling infrastructure study tours here in Assen. Given the content of my last few blog posts, readers may wonder whether there is anything worth seeing. First of all, as I emphasized at the end of the last section, it's important to note that the problems which I write about are not confined to this one city. 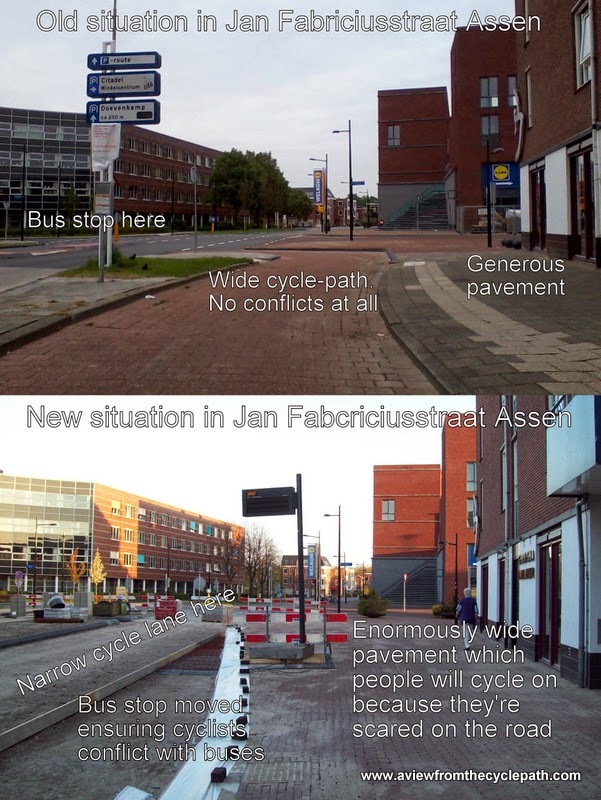 Other cities in the Netherlands are making the same mistakes as Assen, but it seems that almost no-one is writing about these mistakes. The Netherlands still leads the world in cycling and Assen still has better infrastructure on average than most other Dutch cities. That's why we live here. There are plenty of good examples of infrastructure here as well as the less good and we show both of these on the study tours. There is nothing at all for us to gain from presenting a fairy-tale view of a perfect cycling environment. We are not employed to represent the city, and we certainly do not engage in city marketing. We present the reality, "warts and all". I don't write blog posts about the newest unproven infrastructure or regurgitate press releases which claim improvements in safety which are not confirmed by actual data. I caution against assuming that everything Dutch is worth emulating because it is only by copying from and improving on the best examples in the Netherlands that real progress can be made elsewhere. The best examples are not necessarily the newest, and they are usually not the most well publicized either. Click right here for more details. This year is our tenth of running study tours. We again offer an honest and independent appraisal of what works and what does not work in the Netherlands, with no commercial reason to push one solution over another. The new development in this street is one of the most disappointing things I have seen happen since I moved to the Netherlands. There is nothing better for cyclists about the new arrangement. Cyclists are squeezed into a 1.3 m wide on road lane for the full length of the street. The road, extra wide pavements with space for cars to park and a grass verge in the centre all have more space than cyclists. In this photo you'll see how many people cycle against the flow because there is no convenient place to cross the road to continue in this direction. The cycle-path which used to exist in Jan Fabriciusstraat should have been kept and extended up to this junction. Cyclists have just 1.3 m of space, but the problem of trucks using even this narrow cycle-lane for unloading has not been resolved. That this continues to happen is an indication that the provided parking bay is not convenient for the truck drivers. For whom precisely does this design work ? 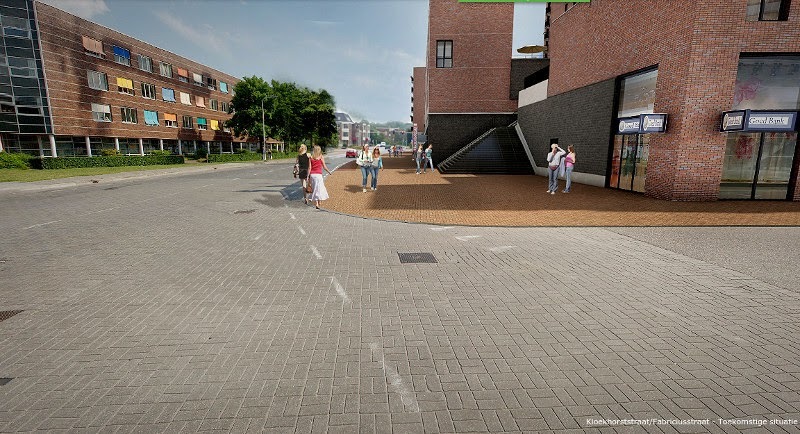 Having created a dangerous situation in the Cite / Citadel development and along Jan Fabriciusstraat, the architects unintentionally but inevitably actively encouraged cyclists to ride on the pavement in the enormously wide and inviting space reserved for pedestrians. So what's happened now ? The council has now started to fine cyclists who use the pavement, making an already awful situation even worse. It's not the cyclists who should be fined. They are merely reacting to the difficult and dangerous conditions created for them. It's the architect who created this problem. I'd like to see a €55 fine claimed from the architect each time that someone cycles on the pedestrian zone in this development. Cyclists in the pedestrian zone. Note how wide it is, and how little conflict with pedestrians this creates. This should be an area where you can cycle. Faces fuzzed out to protect the innocent. Fine the developer and architect who created this ridiculous design rather than those who are struggling to make use of it. Cycling continues along here because that is the only way to reach the cycle-parking. Do these shops want customers or not ? 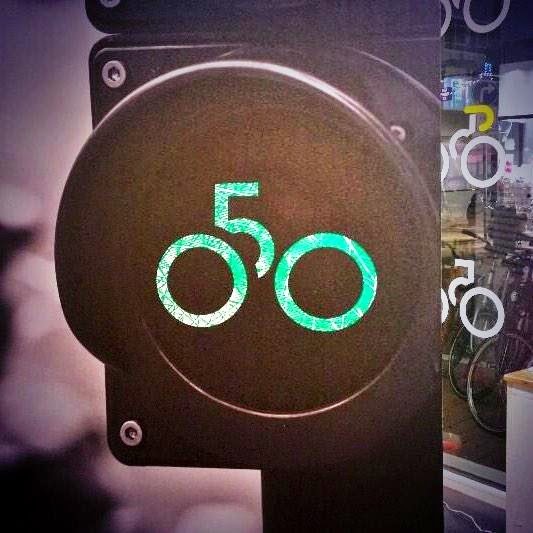 If they do then it's time to get behind their customers, most of whom arrive by bike, rather than fining them. More concrete desert above the shops. Cyclists have to climb stairs and then push their bikes over all of this space to reach the cycle-parking by their homes. More concrete desert alongside Jan Fabriciusstraat. It's forbidden to cycle here. You are allowed to cycle only in the illegally narrow 1.3 m wide on-road cycle-lanes which are regularly blocked for deliveries or to empty those bins. Cite / Citadel is again in the news locally. The reason why is that they now want to close the indoor cycle-parking. This indoor cycle-parking was never part of the original design but required removing some car parking spaces. Because it's in the car park, the air stinks and cars drive around the cycle-park. This causes conflicts and is now thought not to be safe. It has been pointed out that the result of the closure of the indoor cycle-park closure will be that shoppers will be forced to use cars to access the shops because they won't have anywhere to park a bicycle inside, there will be few places outside, and they won't be allowed to push a shopping trolley from the inside to the outside where their bike is parked. At the same time, residents of the apartments are complaining about the steep ramp which I wrote about in 2016 which they need to use to get their bikes near their homes. Also that the bike storage in homes on this development is inadequate. Only one or two bikes can be parked safely per home. Because of the poor design of the cycle parking in the homes, residents have also been using the indoor cycle parking which was intended for shoppers, so they will lose out as well when it is closed later this month. Before this development was built I predicted it would be a disaster and frankly it is just as bad as I predicted. The air stinks not only in the car park and indoor cycle park but also in the shops because they're linked to the underground car park. There is no convenient way to shop by bike (that's getting worse) and residents also can't use bikes in any convenient fashion. It would be best to raise the whole lot to the ground and build something new which is actually designed around the needs of its residents and shoppers. It would also be a good idea to avoid the architects behind this design. The whole problem stems from the tendency to let project developers design the infrastructure, rather than municipal departments of traffic. I've seen it in other places as well. What you end up with is a mess, and that takes years and large amounts of money to correct. I don't know how this tendency started, but it has much to do with developers getting an ever bigger role. It seems like your developers have borrowed ideas straight out of the Australian or US road design manuals. It's all built around allowing for the aesthetics of trees and bugger everything else. Amazing. It's like you cross the border into a different country. I realized I only post here when I disagree (or think I disagree) with something you've said, and I figured that might get old. So I want to say here how much I appreciate your blog and your videos. My future wife and I will be moving to the Netherlands sometime around October. This is in part because the Netherlands is a very good place to do astrophysics, but also in part because we're both very interested in experiencing and learning from the place with the best bicycle infrastructure in the world. One of our favorite pastimes is watching your videos, which have taught us a ton about cycling infrastructure on the micro design level and the macro planning level. Thanks very much for everything you do! Oh dear... that's awkward. Somebody clearly didn't pay attention when they were in infrastructureschool. Why is it so hard to convince people that they shouldn't have to drive their car to destinations less than two miles away in sunny Walnut Creek, California? Hmmm, maybe I should wander up there before I leave and see the fail for myself.